D.D. (Dolores) Cotton began dancing professionally in high school. Her career brought her to Las Vegas in 1957 and she made the Westside her home until her death in 2009. Cotton grew up in an African-American neighborhood in New York City known as Sugar Hill. Her neighbors included many prominent African-Americans including Joe Louis and Willie Mays. She began taking dance lessons by the age of five, and had her first professional jobs while in high school. She performed at the Apollo Theatre and travelled with her troupe in the United States and to Canada. In 1957, Cotton came to Las Vegas to perform in the show the Cotton Club Review starring Cab Calloway. 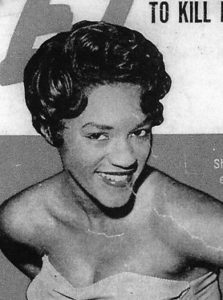 She quickly discovered the segregation of Las Vegas, as she and other black performers were not welcome in the casinos, except for to perform. She frequented the clubs of the Westside, and soon after her arrival, she met Elmer Cotton, whom she married later that year. After marriage, she retired from show business. Her husband’s family operated clubs on the Westside including the Town Tavern. Cotton began working at the clubs, working as keno writer. After learning keno, Cotton began working as a cocktail waitress. She was later hired as the first African-American cocktail waitress downtown. She also was one of the original cocktail waitresses at Caesar’s Palace when it opened in 1966, becoming the first black cocktail waitress on the Las Vegas Strip. In later years, Cotton trained to be a dealer. She worked as a dealer and was promoted to a floor supervisor at the Tropicana where she worked for many years. The interview covers many aspects of entertainment and segregation in Las Vegas during the 1960s. Cotton recounts experiences she had with segregated Las Vegas. She also talks extensively about the development of the Westside.